Similar to humans, plants are up to 85 percent water. Water is what supports the form and shape of the leaves by what is called turgor pressure. Wilting is what happens when plants don’t receive the necessary amount of water. Water is also necessary in feeding the plants. Fertilizer compounds in the soil are carried to the plant’s root system by water. Transpiration occurs when big amounts of water are sucked into the plant through the roots and are eventually released into the air through the leaves in the form of water vapor. The warmer the temperature is, the more transpiration and evaporation occurs. For the same reason people drink more liquids on hot August days, plants will also need more watering as conditions demand it. Knowing when not to water your plants is just as important as keeping them hydrated. Wilting occurs when plants don’t get enough water but plants will also literally drown if they get too much water because they’re unable to get oxygen. Knowing the balance between not enough water and too much water is a big part of growing healthy, good looking plants. You may be over-watering if the plants’ leaves are yellow or a light green, the leaves are browning at the tips, the roots are sparse or the roots are soft and mushy. You may be under-watering if the plants’ new leaves droop, the soil is dry and dusty or if you take the plant out of its pot and the root system is dry. Moisture sensing devices can be bought to help track when plants need water and when they’ve had enough. Sensing devices are often set up directly to the watering system so work on your part is minimal. The device will either start or stop an electrical current to the moisture reading. 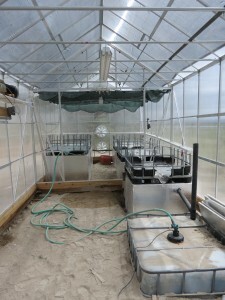 If the water in the soil is insufficient, the sensing device turns on the watering system. There are other sensing devices that control watering by the evaporation rate. Thermostats and humidistats together can also provide accurate water balance. While sensing devices can make your gardening life a bit easier, it’s important to put your experienced judgment first. If you have pots that don’t have draining holes, insert a tube or a piece of wood when watering; then water until the end of the piece of wood is wet and then water again when the top inch of soil is dry to maintain water balance. With pots with draining holes, water thoroughly and let the water drain out, then water again when the top inch of soil becomes dry. Many gardeners feed plants with tap water without thinking to check the temperature without realizing that a plant’s soil solution is generally 60 degrees or higher and that the water from the tap should be about the same. Most tropical plants will not be able to handle the cold water and will go into shock and possibly destroy small root hairs and stunt growth. If your greenhouse has piped water within it, you can run it close to the heat source in order to warm the water or wrap a heating cable around the hose for the same outcome. If you use a sprinkling can, simply run the water until it feels warm to the touch before watering your plants.